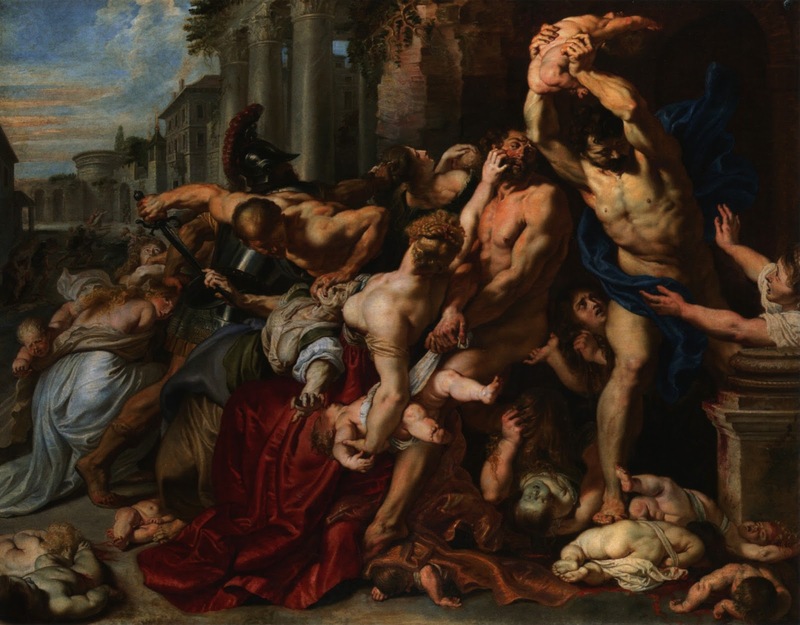 Today the Church commemorates the slaughter of the Holy Innocents, those children 2 and under who were slaughtered by Herod in an attempt to stomp out the Christ child. Evil is flipping what is true on its head, evil is, then, the anti-truth. And could there be anything more opposite the Truth than to FEAR children? To see children as a THREAT? And yet, in our world today, in our western culture, we have slaughtered hundreds of million through abortion and countless HUNDREDS of million through the use of the contraceptive pill which also causes abortion as well. To see children as a threat is the surest sign that a person is under the influence and is listening to the Evil One. 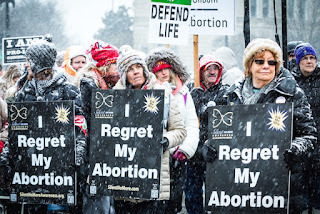 And so if contraception and abortion are agents of the Evil One, then where ought we to look for resistance to the Evil One - - - ONLY the Catholic Church has held the line that abortion and contraception are always and everywhere MORALLY EVIL. When I was a teenager, I read over a letter my Dad had written to a brave and awesome Protestant missionary who was putting his life on the line preaching the Gospel in Turkey. My Dad was sharing with his friend that one of the main things that convinced my Dad of the Truth of the Catholic Church was that it alone had not caved on the issue of contraception and abortion. But here's the thing. As Pope Paul VI said, the world doesn't listen to teachers, it listens to witnesses. I see on Facebook a lot of people saying "I wish priests preached on contraception/abortion more!" 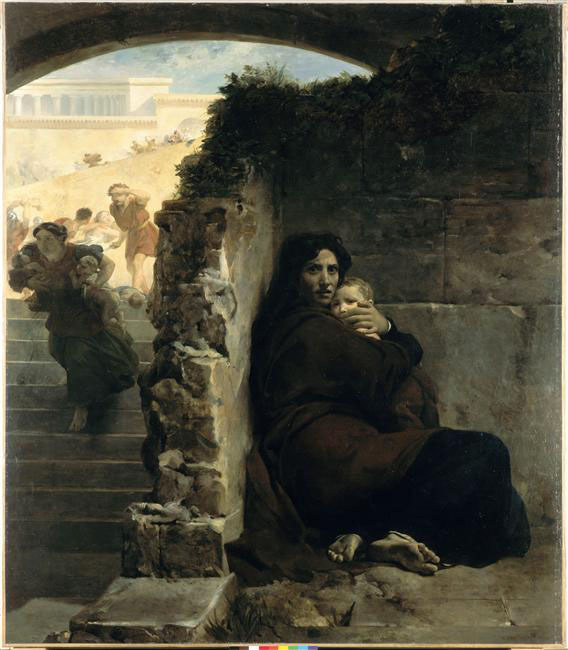 I understand the frustration, but at the same time, I think we need to realize that while priests could and sometimes SHOULD be stronger/clearer on the issue, the REAL opportunity for converting our society and helping them realize they are no better than Herod is to have the LAITY PREACH TO THEIR FRIENDS/FAMILIES/COWORKERS about this important issue, because a bunch of celibate, unmarried men talking about it doesn't sway the hearts of the larger society much anymore. 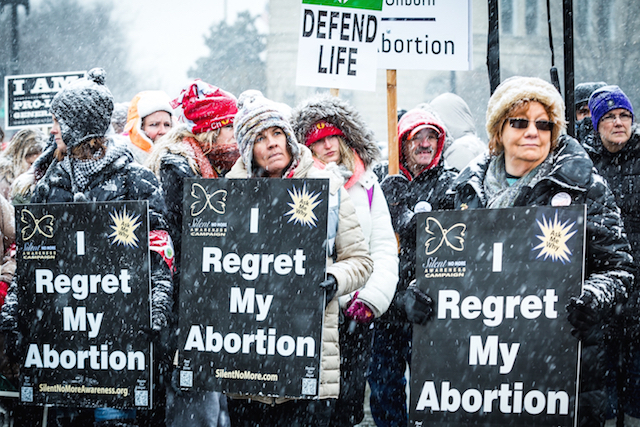 I've been to the March for Life many times, and THE most powerful element to the March, BY FAR, is the hundreds of women near the front who march carrying signs that say "I regret my abortion" - seeing those women is more powerful than ANY homily against abortion or contraception that has ever been delivered. People only listen to witnesses. Will you witness to those who are waiting to hear from you? You may say here - "But I've used contraception before" or "But I've had an abortion in my past"...all the more are you now able to speak about your own experience - you can tell people "I used to use contraception, and I regret it" or "I had an abortion, and I regret it"...we need your voices too!!!! Your past sins do not exclude your voice, they lend it even more authority today! Innocents are being slaughtered on a massive scale daily in our Western Society. Are we speaking up to the world, or are we sitting around blaming our priest for not saying more while we refuse to talk with our fellow parishioners/family members/coworkers? Holy Innocents, pray for us, that we may have the courage to speak out against the slaughter that is continuing today, and may our culture stop viewing children as a threat. May we begin to become a culture of life! Every year at Christmas Masses Catholic priests look out into the congregation and see lots of people who they do not recognize. As a pastor, you know some of them are friends and family from out of town, and some of them are people who are checking out Catholicism, maybe for the first time, but there are also faces you recognize but haven't seen for months (maybe even since last Christmas), the faces of those who have fallen away from the Church and are no longer practicing their Faith. 1) You are happy that people are there hearing the Word of God and you tell yourself "A person can't be at Mass and NOT encounter God, whether it is the beauty of the music, being in the presence of the Eucharist, hearing the Word of God proclaimed, etc." 2) On the other hand, you as the priest are asked to reach out and help bring EVERY PERSON in your parish boundaries to Christ. And so a part of you knows that one Mass a year is not sufficient to sustain those that know better. So, out of love, you want to challenge people to do something closer to the minimal hurdles the Church puts forward for people to clear in order to be practicing their Faith. And, let's be honest, there is, among those who know they ought to be coming weekly, a hypocritical thing going on when one attends a Christmas Mass; a pretending that things are in right order that are really not. Our society recognizes that it is weird to come to a party or a wedding reception if you don't actually know the people for whom the party is being celebrated. But aren't people doing that when they come to Christmas Mass and that's their "Catholicism" for the year? Yes, we're glad for every soul that is at Mass, but if you genuinely love someone do you let them persist in a deception, even if they are deceiving themselves? NO! If someone was raised in the Faith, was brought up in the Faith, and should know better, is it "pastoral" to pretend that there's nothing wrong with a person ignoring the call to practice their Catholic Faith 364 days a year? So, in the midst of one of the most beautiful times of year when people not asked to help save people in a particular geographic region simply want to sit in the peace and joy of the season, pastors wrestle with the question "How do I celebrate this feast and yet try to throw a life preserver to the people who I may not see again for another year?" If somebody writes a blog post or an article about how it is really simple for priests to just think about the positives of increased Christmas Mass attendance without thinking about what it means in a negative sense, they are not a person who has been asked to try to work for the salvation of every soul within a particular parish boundary. And this question is really a microcosm of being a pastor in general - "How do you invite people to a life that is completely full of joy and peace and yet warn people of the perils of not heeding the call"? There are several things that the Catholic Mass is criticized for. It is these same things that Christmas is actually typically LOVED for. The word “Christmas” is two words put together – “Christ’s Mass” – what we love about Christmas is available at every Mass because EVERY Mass is actually “Christ’s Mass”. THIS is why marriage being between 1 man and 1 woman MATTERS! One of my ministry assignments is a university, and so I follow fairly closely the types of things being discussed in university settings. 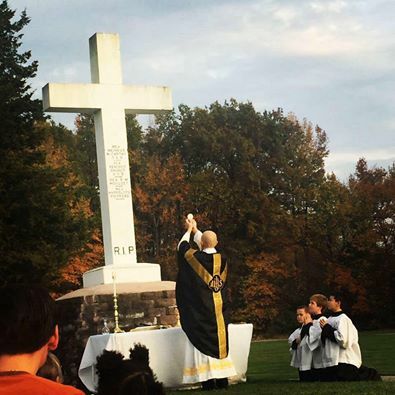 In addition to the much-publicized "safe space" and "trigger warning" phenomena, many university-types speak often about "cultural appropriation"
At the outset it is important to acknowledge that there have been countless instances of missionaries utilizing pagan cultural customs and giving them a religious dimension. That is not cultural appropriation as it was never being done in that instance by a dominant culture. Trying to explain the Christian faith by missionaries through the use of local symbols, pagan or otherwise, is not cultural appropriation. White people stealing inner city cultural elements is not white people trying to explain white culture to black people. 1) Christmas. 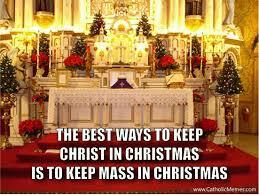 Christmas is made up of two words - "Chirst's Mass". Our American culture has taken Christmas and murdered both the "Christ" part and the "Mass" part. Beyond the mainstream secular culture, a smaller subset of our culture has kept the "Christ" part but still jettisoned the "Mass" part. Today many people are upset that our world doesn't say "Christmas" enough. I say the opposite. I say our culture says "Christmas" WAY too much! No one should really say "Christmas" unless they are talking about the celebration of "Christ's Mass" on December 25th. I highly encourage those who have appropriated Christmas to stop immediately, and, if they seek to get rid of both "Christ" and "Mass" to find some alternative phrase like "Season's Greetings"
I highly encourage those who have appropriated Christmas, but want to keep the "Christ" part to immediately begin using a phrase along the lines of "Merry Christworshipservice"
I recently heard a national talk show host say, the day after Halloween: "Halloween needs to be a day that gets moved year to year so that it is always part of a three day weekend." If it is possible to have something Catholic more culturally appropriated than Christmas, Halloween would be it. 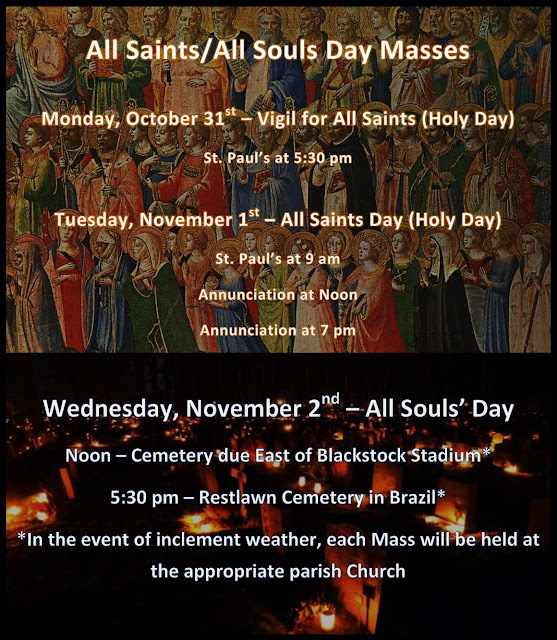 "Halloween", like Christmas, is a Catholic word and celebration. Hallows Eve - the night before All Hallows Day or All Saints Day. That's what Halloween is. 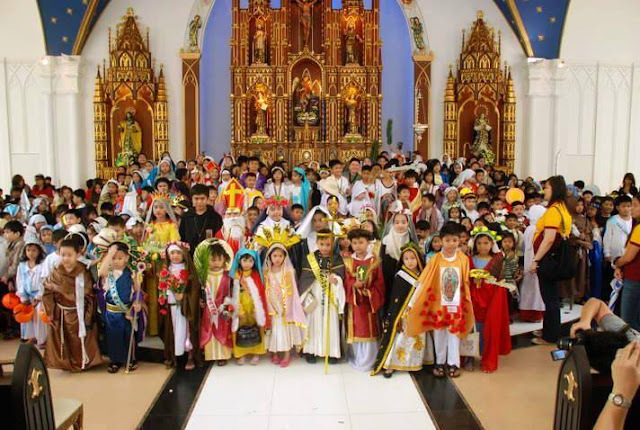 People dressed up like saints the night before to celebrate the great holy day the next day. To dress up as nurse-prostitute or a demon or a bloody horror film star and to speak about a desire to move Halloween to a more convenient day so that a person can drink and stay up later partying seems to be the zenith of cultural appropriation and a swallowing up by one culture of another and, while keeping the name the same, spitting something out that is its exact opposite. All Hallows' Eve in its proper cultural context. Stop "appropriating" our celebration!!!! A GREAT IRONY EXISTS: One of the greatest moments that sends liberals into "cultural appropriation accusation spasms" is Halloween - because so many college students dress up for Halloween parties in culturally appropriated outfits (rappers, native American Indians, Mexicans, etc.) BUT THE CONCEPT OF HALLOWEEN ITSELF HAS BEEN APPROPRIATED BY THE APPROPRIATION POLICE THEMSELVES!!! All I'm really lobbying for here is just acknowledgement at this point. I'm not sure I'm ready to go to war over these particular issues, and I don't think fixing these two particular instances (among many) will actually fix the deeper issues of our society. All I'd like at this point is for those that feel so violated by cultural appropriation at least acknowledge Catholicism as its greatest victim. Sing a Little Louder from KingdomWorks Studios on Vimeo. The essence of the Good News? Perhaps it is "God has a plan for you!" What can we do? How do we ensure that we are not being consumed by the deadly sin of pride? 1) Can I be alone with myself – do I pray regularly and go off to be alone with God? 2) Go to confession regularly – Why Jesus set it up this way – GOOD TO SAY IT OUT LOUD! 3) Do I bend Church teachings to me or do I bend my will to Church and Scriptural teachings? A class on the hierarchy of the Church, and CARDINAL Tobin! So each week I teach a class on line for our high school religious ed students. As Providence would have it, the class topic in the textbook this coming week is on the hierarchy of the Church, including the role of cardinals...the same week Archbishop Tobin was designated to become a cardinal in just over a month! 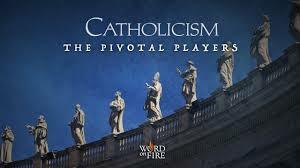 I doubt anyone who reads this blog is waiting on me to endorse/review Bishop Barron's new DVD series "Catholicism: the Pivotal Players"...but just in case...it is literally MUST SEE TV! The saints of the Church are catechisms in the flesh - people who show us what it means to follow the call of the Gospel, and so our souls, looking for nourishment and inspiration, should never tire of hearing. This sequel to the unbelievably amazing Catholicism series by Bishop Barron is a six-episode exploration of six major players in the Catholic Faith. I learned so many interesting facts - such as the role Notre Dame University played in the life of G.K. Chesterton and SO MANY other interesting tidbits. "The Pivotal Players", like its predecessor, is shot with amazing skill, the music is perfectly on point, and the series is such a synthesis of Truth, Beauty and Goodness! It is a must-see and I can't recommend it highly enough. Bravo to Bishop Barron and the Word on Fire team! Here's the trailer. Pick up your copy today! Primer: In the run-up to the preparatory and actual synod on the family, Pope Francis was rumored to prefer extending the Eucharist to the divorced and remarried who had not received an annulment from the Church. That preference was pretty well stifled and shot down by those at the Synod. 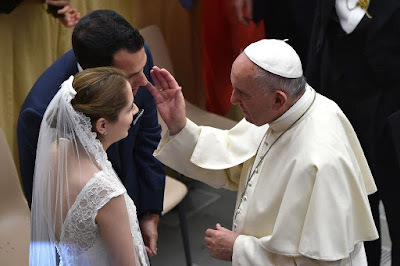 The Pope's synod wrap-up document, however, left the door open, and, last week, a letter was leaked whereby the Pope told some bishops that they were right to interpret his document as indeed affirming the distribution of Holy Communion to the divorced and remarried who did not get their first marriage annulled even though their first spouse is still living. Okay. That's out of the way. 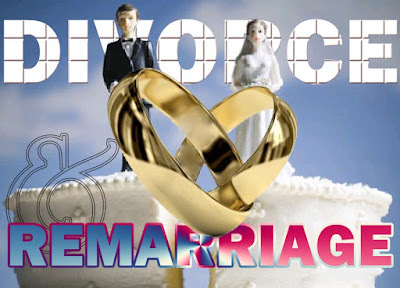 1) I do not have a doctorate in moral theology, but based on what I've read in the seminary and afterwards in my own personal study, I believe it is wrong to extend the Eucharist to the divorced and remarried who have not received an annulment even though their first spouse is still living. 2) We can disagree with the Pope, and we can debate these issues, and we can do this publicly. 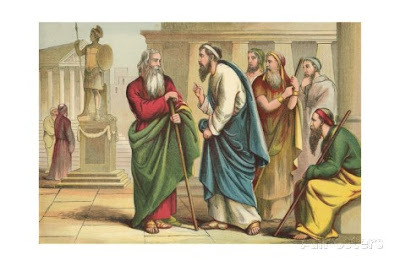 As I mentioned in a previous post, Peter was leaning towards requiring all those joining the Church to get circumcised and follow Jewish dietary laws. He was rebuked by Paul. Was Paul wrong to go confront Peter? If he hadn't, the Easter Vigil would be MUCH more painful for men joining the Church, and no Christian would be eating bacon. 3) I can disagree with the Pope while not having to think he is the anti-Christ. Some in the Church seem to see the Pope and his pretty obvious preference for how this question should be settled as proof that he is a horrible person in general. If we commit this error, however, then we are just as guilty of committing the crime we charge secular atheists with in our culture - the crime of equating a person's belief TO that person. I can disagree very passionately with the Holy Father's stance, particularly since it has not been formally promulgated in any way, but I don't have to walk around thinking poorly of the man Pope Francis. Peter and Paul disputed over central teachings of the Church. That doesn't mean St. Paul went around grumbling and hating Pope Peter I.
GK Chesterton and George Bernard Shaw could not have been at two more opposite ends, theologically. Chesterton was a committed Catholic and Shaw a committed secular atheist. They went back and forth in the papers regularly arguing and debating each other through their columns...and yet they would get a beer together and were friends. So many in our own day will take our position on homosexual "marriage" and equate it to us. They hate our argument (obviously) but they ALSO HATE US. We're asking them to start by not hating us. It seems only fair, then, that those who disagree with the Holy Father should start by not hating him, even when they disagree on this issue that is still, nonetheless, extremely important. 4) We should also avoid the cataclysmic talk about how this is a sign that the Church is getting ready to get ripped in half, its the apocalypse, etc. The Church has been here countless times before, and was in this position almost right from the start. We've been here before, and we shouldn't lose our minds over this. In regards to the struggles we see in our nation, some today advocate for big government to fix problems and injustices of our world. 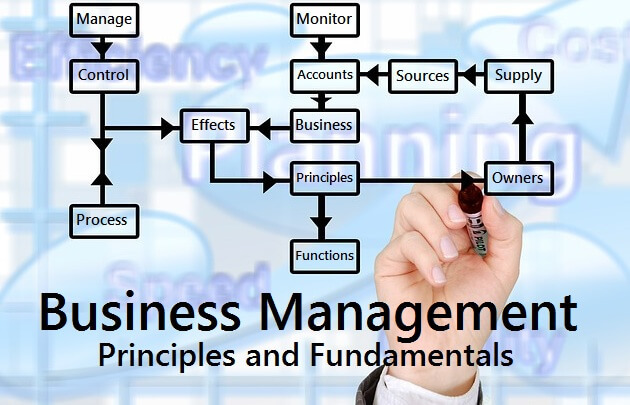 Others believe that corporations and businesses, if left essentially alone, will fix the injustices of our world. But what is the Church for? Does the Church recommend bigger governmental structures? The Catholic Church advocate for large corporations fixing our social ills? In short – the answer is neither. One of the most refreshing and interesting concepts for me as I began to teach CST – subsidiarity. Subsidiarity, briefly, is the idea that things in our society should be left to the lowest level possible. Buying and selling should be done as locally as possible, politics should be done as locally as possible, schools should be run as locally as possible, etc. etc. So, let’s first look at the problem with big things. Big government. Big corporations. 1) First of all big things tend to see people as objects because people are not being dealt with as individuals. Many of the most heinous acts in the history of civilization, the Communist Regime, The Nazi Regime, the proliferation of abortion etc. are/were done under the thought of “helping save the world” on a large scale – lots of people have tried to help humanity and in the process harmed humanity. As a villain in The Brothers Karamozov put it, “I love mankind. But I find to my amazement the more I love mankind, the less I love individual people.” How true. When we view human beings as a whole, and when someone comes with a man made plan or program to “help humanity” history shows us you better run! 2) It leads to the mistreatment of individuals by putting distance between various people that are part of the system. For example: – I have never met the person who makes my shoes, who makes my clothes, nor have I met the person who picks my fruit nor the person who helps in any phase of the food I eat besides the person at Kroger who swipes my purchases. Nothing I own have I ever met the person who made it or grew it. And so we hear in the first reading: “Hear this, you who trample upon the needyand destroy the poor of the land!”…the scale at which things are done allows others to trample on the needy for me and for me to plead that I had nothing to do with it. We also see a problem with all of the shipping/packaging/production that comes from large corporations in our consumeristicly dominated way of doing things. Looking at food as an example, instead of local food, Most food is harvested by people I’ll never meet in a way that I will never know in a place that is far away. It will then be shipped a great distance, using up fuel, packaged somewhere, using energy and material, and then shipped again a great distance to me. Vs. my neighbor picking corn, walking across the street, and selling it to me. Although there are lots of issues when things in our society get too big, there is a lot of reasons for hope. 1) It is something that our larger society has awoken to, and so we have this big moment to stand up and say “Hey, this whole grass fed local beef thing, this whole organic food movement, this whole shop local thing, this whole find someone local to do the job thing, our Church has been talking about this since 1892!!!! Not only is it just a social fad, we have a theological reasoning behind why it is so important. Some of our greatest writers and thinkers over the last 120 years have championed this as THE issue of our time. Hillaire Belloc’s book on the topic “THE CRISIS OF CIVILIZATION”!!! GK Chesterton was a jolly and witty English writer whose writings are loved still today for their humor and levity – I’ve read most of his stuff and he has a huge following. His tone changes completely when talking about two things – birth control and subsidiarity. 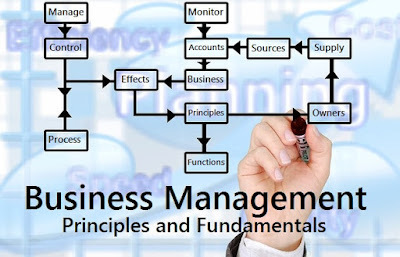 He describes this attempt to dig out from under large governmental and corporate structures as THE BATTLE of our time. Another pivotal Catholic, JRR Tolkien, said that this concept was precisely the reason he write his Lord of the Rings trilogy, with the simple hobbits as the ideal society under the Catholic world view, and those who were evil seeing only more things to produce, build, pollute, and dominate. So a culture that is hostile to many things in our Church, I think we are missing this great opportunity to point out this one great moment. Even those that don’t profess Christ to be their savior have recognized the importance of this key Catholic teaching. And so we have a perfect illustration of what we hear in our Gospel - “For the children of this world are more prudent in dealing with their own generation than are the children of the light” We’re the ones that should be talking about subsidiarity as a key issue, but it is those who often don’t profess to follow Christ who are leading the charge here. 2) People are recognizing that the pace, size, materialism, consumerism etc. are not making people more sane, they are driving people insane. So, in thinking about subsidiarity, how do we put it into action? How do we catch up to those who have already begun to make this a priority, how do we work to ensure that the needy are NOT trampled on, whether they are my neighbor or working in Thailand? 1) Some before making this leap, want real specifics. What will it look like, how will it work, etc. etc. 2) Start asking myself, as Pope Francis has been challenging us, am I guilty of a consumerist mindset? Do I believe that to be patriotic, I must buy as much as I can, as conveniently as I can for as cheap as I can? Or can I get by with less stuff? Is the amount of stuff I have, is the way I consume things actually making me MORE miserable, stressed, etc. The first Pope in the history of the world, Saint Peter, had his own personal opinions about how the Church should approach both circumcision and dietary laws. When it came time to issue definitive statements on the topics, the first pope did not end up teaching what he had personally held to be best before he was rebuked by his fellow leaders in the Church. Pope Benedict also made it quite clear in the introduction to his Jesus of Nazareth series - these are the personal thoughts and musings of mine...not the definitive statements of the Pope. Until they are blue in the face people can tell me the personal beliefs that Pope Francis holds, the personal opinions he has shared on airplanes, the personal opinions he has shared in private letters. I don't care. When something is taught definitively and unambiguously as the teaching of the Church. Let me know. Until then, I don't care. Archbishop Lori Nukes the Civil Rights Commission's "Report"
WASHINGTON—Archbishop William E. Lori of Baltimore, chairman of the U.S. bishops' Ad Hoc Committee for Religious Liberty, responded to a statement issued last week by the chairman of the U.S. Commission on Civil Rights upon the issuance of its report on "Peaceful Coexistence." For the current Chairman of the United States Commission on Civil Rights, religious liberty is reduced to "nothing except hypocrisy," and religion is being used as a "weapon… by those seeking to deny others equality." He makes the shocking suggestion that Catholic, evangelical, orthodox Jewish, Mormon, and Muslim communities are comparable to fringe segregationists from the civil rights era. These statements painting those who support religious freedom with the broad brush of bigotry are reckless and reveal a profound disregard for the religious foundations of his own work. People of faith have often been the ones to carry the full promise of America to the most forgotten peripheries when other segments of society judged it too costly. Men and women of faith were many in number during the most powerful marches of the civil rights era. Can we imagine the civil rights movement without Rev. Martin Luther King, Fr. Theodore Hesburgh, and Rabbi Abraham Joshua Heschel? In places like St. Louis, Catholic schools were integrated seven years before the Supreme Court decision in Brown v. Board of Education. Jesus taught us to serve and not to count the cost. Our record is not perfect. We could have always done more. Nevertheless, we have long taught that the one God, maker of heaven and earth, calls each and every individual into being, loves every individual, and commands believers to love and show mercy to every individual. The idea of equality, which the Chairman treats as a kind of talisman, is incomprehensible apart from the very faith that he seeks to cut off from mainstream society. Today, Catholic priests, religious and laity can be found walking the neighborhood streets of our most struggling communities in places abandoned by a "throwaway culture" that has too often determined that quick profits matter more than communities. We are there offering education, health care, social services, and hope, working to serve as the "field hospital" Pope Francis has called us to be. We wish we were there in even greater numbers, but we are there to humbly offer the full promise of America to all. 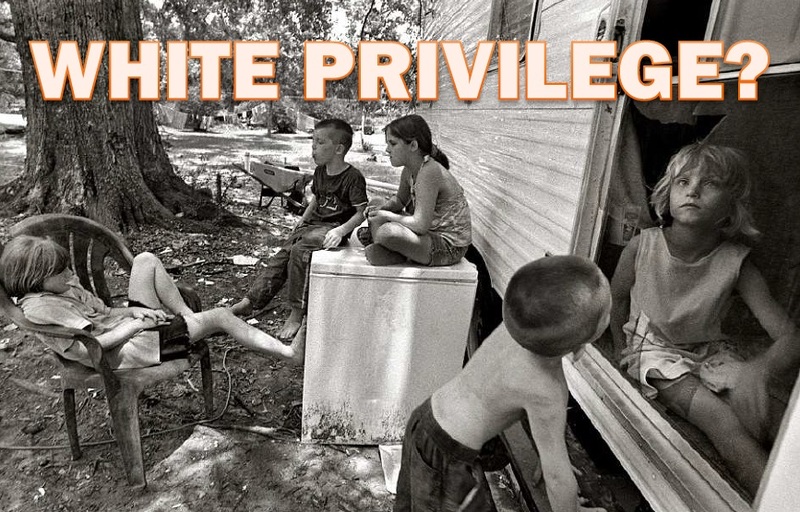 Rest assured, if people of faith continue to be marginalized, it is the poor and vulnerable, not the Chairman and his friends, who will suffer. Catholic social service workers, volunteers and pastors don't count the cost in financial terms or even in personal safety. But, we must count the cost to our own faith and morality. We do not seek to impose our morality on anyone, but neither can we sacrifice it in our own lives and work. The vast majority of those who speak up for religious liberty are merely asking for the freedom to serve others as our faith asks of us. We ask that the work of our institutions be carried out by people who believe in our mission and respect a Christian witness. This is no different from a tobacco control organization not wishing to hire an advocate for smoking or a civil rights organization not wanting to hire someone with a history of racism or an animal rights group wishing to hire only vegetarians. In a pluralistic society, there will be institutions with views at odds with popular opinion. The Chairman's statement suggests that the USCCR does not see the United States as a pluralistic society. We respect those who disagree with what we teach. Can they respect us? We advocate for the dignity of all persons, a dignity that includes a life free from violence and persecution and that includes fair access to good jobs and safe housing. People of faith are a source of American strength. An inclusive and religiously diverse society should make room for them.